The non-clinical spotlight series exists to shed light on all of the interesting paths that physical, occupational, and speech therapy professionals hfave taken. 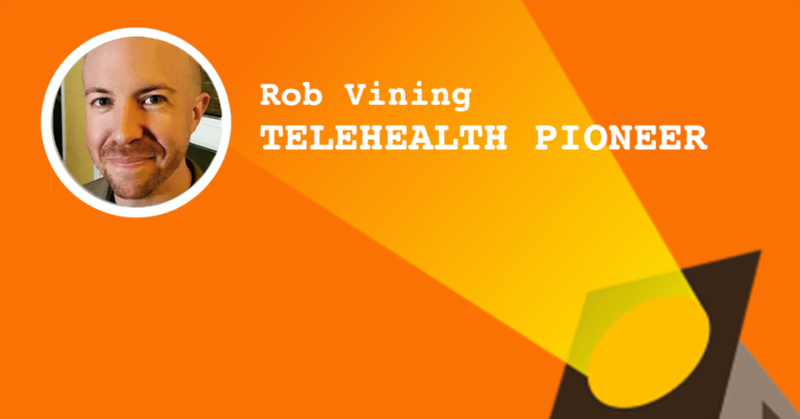 Today’s spotlight focuses on Rob Vining, PT, MSPT, who went from physical therapist to telehealth physical therapist, tech pioneer, and leader of a telehealth physical therapy residency! Want to be featured on The Non-Clinical PT? Know of someone who’d be a great person to interview? Please reach out today! What year did you graduate from PT school, and from where? Did you know what you wanted to do during PT school? If so, what was it? I initially thought I wanted to go into pediatrics, but that changed after I was exhausted after my initial four-week attempt at a pediatric setting during school. Then, I shifted to ortho and always had the integration of tech and ortho/PT in general in the back of my mind. What did you do when you first graduated? What did you do next? When I first graduated, I spent 2.5 years working at an outpatient hospital setting in Austin, where I worked with a couple of the McKenzie faculty members, and was able to soak up everything from that experience. This reinforced my thoughts about seeing and helping patients without touching them. As it turns out, 75% of my patients got better with education and testing/retesting, with no touch required. Most patients were able to be empowered by solving their original complaint(s) with exercise and education; my hands were not even part of that equation. At what point in your career did you consider doing something non-clinical? I always wanted to keep myself in the tech space, as I had created an independent streaming radio system called “RadioAid.com” back in the day, before and during PT school. After working on DirectPT.com for a while fresh out of school, that solidified my belief that telehealth was a viable option. I worked with patients over MSN messenger, and basically had the first outpatient ortho clinic that was 100% telehealth! People were finding me via Google for the search “Online Physical Therapy” and I had entered that in my website’s title bar originally, and was on the first page of Google for “online physical therapy” pretty quickly. It was something that got crushed as soon as Google shuffled their search algorithm and I went from the first page of “Online Physical Therapy” to page 12. It crushed me because I had no idea about SEO, and I devoted my time to working in the clinic and honing my assessment skills. I still would see patients here and there via telehealth as needed in specific situations, but I put it on the back burner until about three years ago, when my wife came up with the initial concept. I thought about how a system could be created to make PT an on-demand profession in a way that would help everyone in the profession, PTs and clinic owners alike. I wrote about that here. When that came about, I dove head-long into the development, raising funds and finding the right developer crew to create the project. Everything fell into place to make the idea a reality. But the customer base was much more difficult to approach than I initially thought. PTs just don’t know the tech space. At all. Editor’s note: YET! Read on to learn more about Rob’s telehealth residency program! Can you tell us a little bit about PTlive? Insurance submissions. Patients can submit their insurance info, and it will send their eligibility to the clinic. On-demand care. Patients can chat with an on-demand licensed PT. The PT clinic can specify who chats, and in what order. If none of the clinic’s staff members happens to be available, the PT clinic can allow the system to pull in any of our > 250 PTs to answer questions. Consults and pre-screens. PTlive also allows for the PT to plug in any video chat system they use (doxy.me, zoom.us, Google hangouts, etc.) in order to launch a telehealth consult or pre-screening for the patient. In states with direct access, this allows therapists to immediately parlay that consult/pre-screen right into treatment. Another option is for the therapist to simply perform a short consult to answer questions in a digital face-to-face format. How does telehealth help improve patient engagement and acquisition? It creates an environment that allows on-demand answers to patients’ questions. Rather than having to look all over the PT clinic’s website to hunt around for a simple answer (or the info they need to be convinced to come in for an initial evaluation), it’s all available in live time. It also provides everything that a clinic would need to convert website traffic into new patients. No other service allows a clinic to do this currently. Other clinics have tried to use a live-chat system that is staffed with their own front office workers, but that is the last thing you want to do: give the over-tasked front office one more task, which most of the time, they wind up ignoring. After all, there’s nothing like that “sorry we’re not here, send us a message and we’ll get back to you” message to turn a potential patient away. Instead, he or she hits the back button, goes back to Google, finds another local PT clinic and bam, that original clinic missed a potential new patient. What about PT Tech Talk? Is that related to PTlive, or is it something else? But I was a consistent nag, and it didn’t take long and we recorded our first episode where we just hit record on zoom.us and started talking! He was running Vinitial at the time, and I was a few months into PTlive, so we created the podcast and had zero traction at first, yet slowly but surely over the last 2.5 years, we’ve grown a consistent base of PTs and other healthcare professionals interested in using tech. Dave and I had no issues with both of us having separate tech platforms because we knew if we took a growth mindset vs. a fixed mindset, we could accomplish so much more with our show, and that’s been the case! I know you’re one of the thought leaders in PT telehealth. How did you get involved with that? I think I simply got into telehealth because of my history starting a prior tech company and that spilled into DirectPT, and now that’s come back around full circle because I was able to realize that if I’m seeing patients via telehealth, I can’t be available to answer questions that people will want answered in order to make a decision to schedule an initial telehealth evaluation. I’m looking years down the road, but I know PTlive will be a necessary piece of tech on any PT clinic’s website (brick and mortar/telehealth only or hybrid). Can you tell us a bit about where we are with teletherapy and PT (as of June, 2018)? Still relatively new, and it’s a total green-field in the PT space. Cash-pay clinics get this more than insurance-based clinics, but even they still have a hard time knowing how to get things set up, so I’m pushing as much relevant content as possible. I want to inform other PTs who have a desire to go from zero to running a telehealth session and expanding their services to include telehealth in their practice. I hear buzz that you’ve got a telehealth residency going! What is the name? Use code: nonclinical20 to save 20%! What does the residency provide? Who would benefit from it? We take PTs from nothing to deployment of a full telehealth clinic, complete with all systems and processes needed to be set up for success. If you complicate things or start out with zero guidance, it’s super tough to know what’s what. The residency is pretty much the ultimate resource for telehealth. It currently is a 12-week program. As I type this, we are closing up on the half-way point, and right now, everyone’s ready to launch and start seeing patients. We also require everyone to perform 10+ free telehealth visits that are recorded (with previous approval from the patient), and we review the tough parts as they come about. Our goal is to push out PTs who can become the ONLY telehealth physical therapist in their state, which right now, it’s like a virtual land-grab. No one’s doing this, but if you talk to patients after they go through a telehealth plan of care, they see it as something that they never thought was “a thing” until it showed results from day one, without ever leaving their home. Who is this residency designed for? These are the folks that are breaking the mold and pushing the profession in the direction of making physical therapy the most convenient medical profession, as I believe we can become in the next couple years if we work together on sharing, educating, trying methods and sharing the results with one another. Is there anything a potential resident applicant should know? The only thing that I would say is come into the residency ready to become efficient at your assessment skills, because without that ability to listen, dig in with the right questions, and listen some more, you won’t be effective at implementing telehealth into your practice. Is it in person or online? All online 1-on-1 meetings, as well as group meetings each week. Where can someone sign up? Right here! Don’t forget to use the code nonclinical20 to save 20% on the residency cost! You’ve got quite a few plates spinning at once. How do you keep it all together? Sleep becomes optional at times, but recently I have upped my morning routine to include lots of hydration upon waking, immediate exercise within five minutes of waking up, eating a high protein/fat diet, and THEN espresso. My wife and I probably look like a couple of lunatics at our house, dancing around and getting ourselves moving around upon waking up, but we’re a month into the routine, and wouldn’t start the morning any other way! Also, just having a solid scheduling app on my phone has been the key to keeping everything organized. If I set up a meeting, I immediately make sure it’s in my calendar app I use the “aCalendar+” app on my phone. It’s a weird name, but it’s the best bang for the buck that I’ve spent on an app on my phone. It’s created an entire connected system (connects all my Google accounts and sync’s with iCal on my apple devices also. Plus, I’m just an 80% work-a-holic. I can’t get enough of creating things and sharing. For example if you look at anything I do, there’s an end goal of providing all the information needed to either spark your interest or show you the exact steps to use tech in your practice. What have been some of the challenges of entrepreneurship? I love it all, but if you get burned out, you’re useless, so there has to be a limit where I shut everything down and go for a hike or just drive around town with my best friend/wife. Sometimes, we’ll go hang around random coffee shops and stores, or just go to different shops or vintage stores or thrift stores or drive two hours south to hit up my personal favorite micro-brewery (Block15 in Corvallis, Oregon) and stay for the weekend. One thing I’ve noticed is that I can take a weekend off and come back fully recharged if I drop everything and give my brain a break. Bringing tech to the profession as my end goal allows me to talk and chat with some super interesting people! Right now, our profession is at a sketchy stage where we could explode onto the scene as the most convenient medical profession, or we could sit back and do nothing new and fade into a has-been. I want to push our profession towards expanding, and therefore expanding our footprint to help more patients. Some of the most underserved patients are those who are currently limited by geography. They simply don’t have access to healthcare practitioners who can help solve their issue, be it pain, strength, post-stroke, wound care, pediatrics. 95% of what can be treated in the clinic can at least be addressed (or initially triaged) by using telehealth. I pushed very hard to create a beneficial environment for the “unsigned musician” space back before starting PT school, and I see that as a necessary avenue to push forward once again in our profession. Do you have any coursework, books, podcasts (other than PT TechTalk, obviously! ), or anything else you’d recommend aspiring entrepreneurs? I would listen to a wide variety of podcasts! They’re easy to digest while doing other activities, and will give you so many outside perspectives, that it will spill over into other areas of your life, professionally or personally. The more outside perspectives we have, the deeper our well of ideas and creativity can become. Bill Burr’s Monday Morning Podcast… Whew! What is some advice you’d give readers who are considering becoming a telehealth physical therapist and/or entrepreneur? Any pearls of wisdom? 1 – No idea survives first contact with customers. 2 – Entrepreneurship is like jumping off a cliff and building an airplane on the way down. Those concepts are 100% valid, and if you are ok with shipping products before they’re perfect, and taking feedback and adjusting (sometimes with customer feedback, and sometimes with using your gut) to what will make the business successful, and you’re willing to put in the long hours while balancing everything around you, the only way you won’t succeed in the end is if you quit. What about advice you’d give clinical PTs who are hoping to go non-clinical soon? Make sure you love what you’re going towards, and make sure there’s a bridge to go from one area that you’re currently in, towards what you desire to go into that’s non-clinical. It’s totally fine to take the see-saw approach, scaling one area of work down while you build the other area up. If you’re dedicated to pushing forward and putting in the work, sometimes there’s no risk involved, but you can always start with 99% clinical work and 1% non-clinical, and shift that by 3-5% each month, and in a couple years, you can comfortably shift into another position. It doesn’t have to be all or none, and make sure you connect with mentors who can help point out specific road-blocks or mistakes they made in the past, so you can avoid them in your journey. The right mentor can speed up your transition and cut literally YEARS off of the journey. Take that approach, and anything can be accomplished—literally anything. Just get started, and start racking up time and experience in the new area you want to be a part of. People will help you only if they see that you’re committed to change. No one will do this for you, but they sure as heck can help! Thanks for your insight, Rob! There’s a 404 error whenever I look up the residency. Google doesn’t turn anything up either. Where can I find it? Hey Lisa! I’m so sorry. I’m going through and fixing links right now. Here’s the correct residency link: https://www.telehealthprime.com/book-online (be sure to select “residency” in the menu up top). If you sign up, the code nonclinical20 will save you 20%! Thanks for your message! Hi Lisa! Happy to help. Meredith linked you to the correct place! Feel free to email us with any questions. Thanks for the save, Meredith!